Hand-made ceramic chickens available from The Cockatoo. The chickens are available in two different patterns/colours: white with black mottling or black with white mottling. Each colour is available in three sizes or styles: very large, medium or small. The hens are available in just one pattern/colour: black with white mottling. It is available in two sizes: medium or small. The hens and chickens can be grouped or mixed as you wish and as best fits your home. 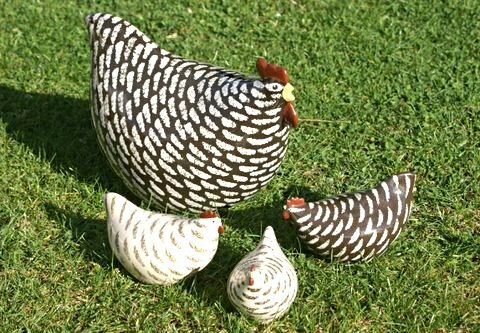 Whether these ceramic chickens and hens can be pecking on the lawn, running on the terrace, resting under a tree, sitting on a table or on the mantelpiece, or even climbing the stairs, they will give your house and garden a touch of humour and style. 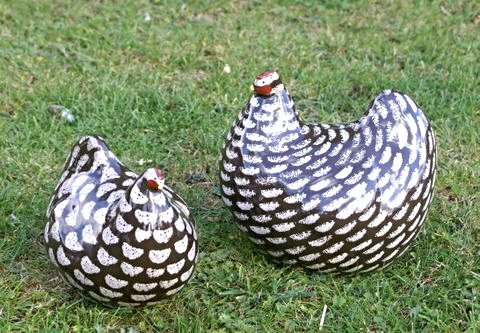 Below are some of the ceramic chickens we have currently in stock.